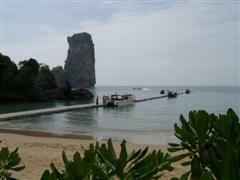 ... continued from Ao Nang and now heading for Ao Nang Beach as we leave Krabi Airport. Just near the exit to Krabi airport were a range of transport options including taxis, minivans and buses that could take us over to Ao Nang. It looked like the staff are not allowed to come out of their individual booths. They were wildly holding up cards to attract our attention, whilst leaning over towards us, but unable to move from the spot they were standing in. Usually I spend a lot of time researching where I am going on holiday and the available transport options. Due to the last minute acceptance by the Centara Grand Beach Resort and Villas of my booking, there was not time to look at any of the options and so I was not as prepared as usual. 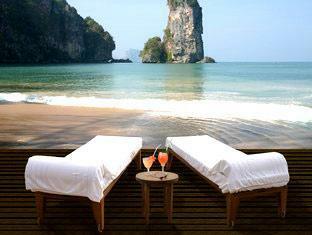 The Centara Grand Beach Resort Krabi is nestled between Ao Nang Beach and Railley Beach in its own secluded cove. You have to take a speedboat to get to the hotel. With rooms located all the way up the steep hillside you will enjoy stunning sunsets and water or garden views. The Centara Ao Nang is ideally suited for honeymoon couples who like to spend time together, kayaking around the cliffs or just relaxing by day and then eating dinner, whilst overlooking the sea in the evening. 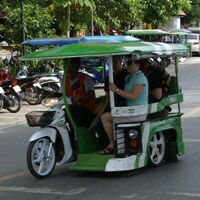 A shuttle service operates frequently during the day back to town or there is the Ao Nang monkey trail for those with a bit more energy. If you have mobility issues, have difficulty with stairs or want the nightlife attractions offered in town, then this place may not be for you. I had booked the hotel using Thai Airways Hotel Vouchers. These are the ones redeemed with Air Miles and previously when I have used them in Hua Hin, Pattaya and Koh Samui my booking has been accepted without question or delay. This time the hotel would only let me book a month prior, they obviously thought that they were going to be fully booked and were holding out for a full fare paying patron and wouldn't accept my booking until the last minute. Anyway given my lack of time for planning I chose the taxi option from Ao Nang airport for 600 baht. All I had to do was tell the driver the name of the hotel, as I had no idea of the hotel's location. 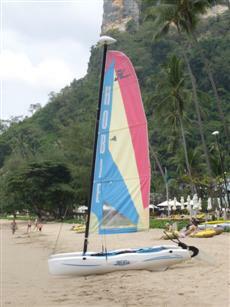 I just knew was that it was in the general direction of Ao Nang town. No problems though as the driver knew exactly where to go. The driver escorted us out into the airport car park and then he set off driving to the Centara Grand Beach Resort and Villas (but not before he had to go back to the booking desk to retrieve my receipt that I had lost in the 50 metres from the desk to the car). The drive to Ao Nang beach took about 40 minutes. We first passed through Krabi town, which didn't look all that inspiring and then on past Ao Nang to the Pier at the end of Noppharatthara Beach. Whilst it didn't come as a complete surprise to me, I had forgotten that the only access to the Centara Grand Beach Resort and Villas was by boat. When the taxi pulled up at a boat jetty I was looking around for the hotel and for a few minutes couldn't quite work out why we were stopping at that place. Fortunately the small speed boat was already waiting for us and after loading our luggage the boat set off from the pier (actually I think the driver telephoned ahead to tell them we were coming and the boat waited for us). We were the last passengers to board the boat and at this point we learned that twelve people were stranded in Heathrow Airport due to snow and ice and that they would not be coming. I reminded myself again of the value of travel insurance and felt a little sorry for those left behind. The boat ride to the Centara Grand Beach Resort took about 15 minutes. The speedboat travelled along the shoreline giving us a good view of Noppharatthara Beach and then Ao Nang beach, before arriving at the hotel which sits on its own beach that is only accessible by boat or on foot. As we approached the hotel we could see the accommodation dotted into the mountainside dwarfed by the surrounding high limestone cliffs. 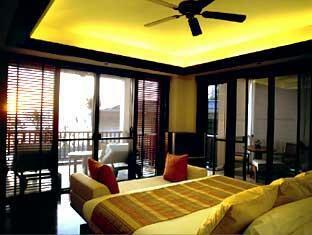 The evening sun highlighted the white walls of the rooms and reflected back from the windows. The whole area was covered in an orange glow and it made a good first impression. Because the whole area around Ao Nang beach and Krabi is a designated Marine Park, permanent structures are not allowed and consequently the hotel is served by a floating pier, which is where the boat docked. The pier was environmentally friendly indeed and a bit difficult to walk on. It reminded of those fun rooms in the amusement parks I visited as a child, where the floor twists underfoot and you have to be careful to maintain your balance. To get to the hotel reception we walked past the pool area with our baggage. It was now late afternoon and people were relaxing in the sun, children were splashing about in the water and there were plenty of spare sun loungers available. This looks good I thought. The check in procedure was smooth and organised and we took the opportunity to upgrade to the package that included use of the Executive Lounge. This included free internet, breakfast, happy hour and 3 pieces of laundry per day and it worked out to be quite good value for us. The plan was to stay here for three days and take it real easy and then to move in to the town of Ao Nang to experience something a bit different. 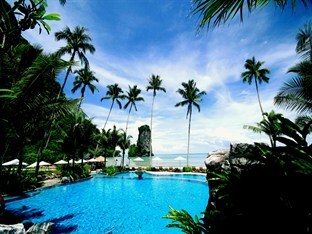 So, if you come from Bangkok to Ao Nang, what is there to do at this hotel? 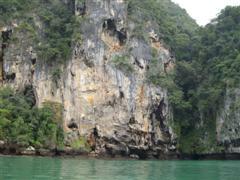 You can even take yourself out into the sea on a small kayak and go exploring around the limestone cliffs. The sea is usually very calm so even the fainthearted like me, can have a quick paddle. The boat that we took to the hotel runs back and forth all day and so you can go back to the town if you want, there is no cost for this but you need to book. If you want to go at other times the local boat operator will take you for a reasonable price. Having its own beach you will not have to contend with hoards of other tourists and the area in front of the hotel is fairly quiet and a great place to relax. I say fairly quiet, because there is constant stream of long tailed boats that pass by the bay on the way to the adjacent Railley Beach, which is just around the headland to the left. The Thai custom is to demonstrate your manhood by having the loudest boat possible and to dispense with the muffler to achieve maximum effect. These boats are not too intrusive in front of the hotel as the sound is only minimal but in the other areas of Ao Nang the noise can become a little irritating. Actually this part of the Ao Nang beach is not totally private and other tourists can come along the Monkey trail from Ao Nang, but they have to sign in with the Security guard. 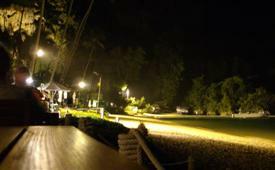 In the evening you can sit at the lovely restaurant located on the water's edge. Here you can eat under stars and watch the moonlight glinting off the sea and listen to the sound of the small waves lapping onto the beach. 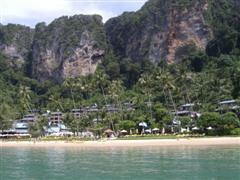 This part of Ao Nang beach is very romantic and I can certainly see why it is a favourite spot with honeymooners. There is even have a little band with singers for the evening. So for three days that is exactly what we did, lounging, sunbathing, swimming and eating and we had a great time relaxing without leaving the hotel grounds. The service was good, the room was nice. 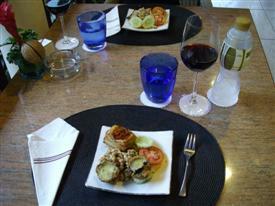 The food selection in the Executive Lounge was not as varied or as substantial as in previous times. The Global Financial Crisis had caused a general reduction in these sorts of offerings in many hotels. We more than made up for it in wine consumption and certainly got our money's worth from the total package and thought that it was really great value. If you need to go into the town of Ao Nang then there is the Monkey trail that leads over to Ao Nang beach for those who like a bit of exercise and and would prefer to walk rather than take the shuttle boat. 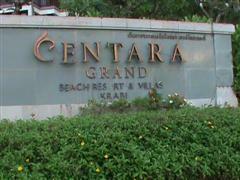 Overall the Centara Grand Beach Resort is reasonably priced, is in a lovely location and we had a good time. I would recommend it to people who like to go somewhere quiet to chill out, it is probably ideal for a honeymoon (although two weeks in the same place might be too much). All good things must come to an end though and after three days it was time to check out and say goodbye and move on to the town of Ao Nang. After checking out we took the speed boat back to the Pier at the end of Noppharatthara Beach and there we found to our surprise that there was a minivan already arranged to take us to our next hotel in Ao Nang. There was no cost for this service and to me little things like this are quite important as they create an atmosphere of high levels of customer service that differentiate one hotel from another. Continue reading about the second Ao Nang hotel that we stayed at and was located in the centre of Ao Nang and within easy walking distance of the beach and the town's many attractions.